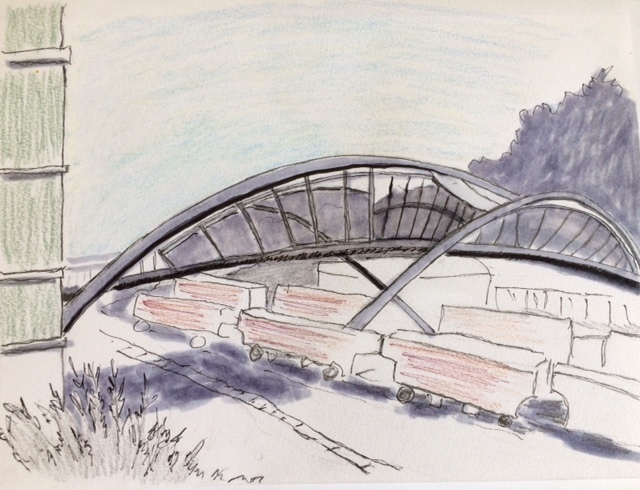 An invitation to draw the Amgen Helix Pedestrian Bridge with Seattle Urban Sketchers was a perfect excuse to figure out how to get access to the bridge. I’ve driven past the entryway on Elliot Ave W many times. From the side of the road, I was always intrigued by the unusual shape I could see. Sunday morning was a perfect day to finally stop and look at a bridge designed after the double helix structure of DNA. The weather was beautiful, cool enough to sit in the sun and warm enough to sit in the shade. 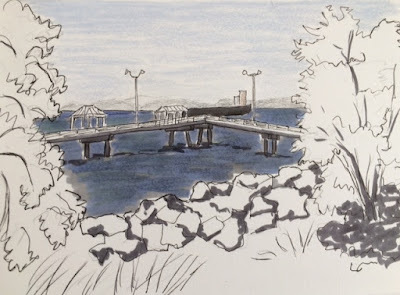 From Elliot Ave W, the bridge crosses over a network of railroad tracks to Myrtle Edwards Park, a mile long bike and pedestrian pathway skimming the edge of Elliot Bay. In the time allotted, I completed two sketches of the bridge. Queen Anne Hill with its stacked apartment complexes rises to the east of the bridge. 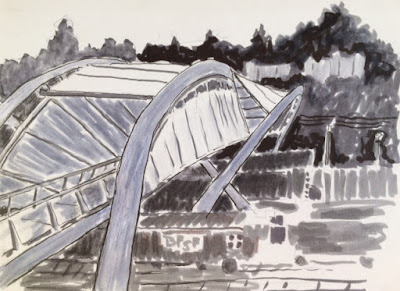 The railroad yard below is a thoroughfare of constant movement and sound. 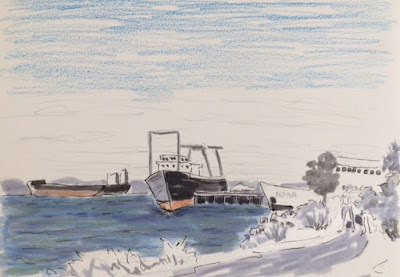 After sharing sketches with the group, I moved on to the Myrtle Edwards Park side of the bridge and continued to sketch. The fresh sea air and water views were revitalizing. NOAA ships and a container ship line up on Elliot Bay near Pier 91 where cruise ships dock before departing for Alaska. A public pier extends over the water. Excellent views of blue islands and sea going vessels are even better when you’re surrounded by water.